In this post I’ll tell you about what the plugin is capable of and how to install it. 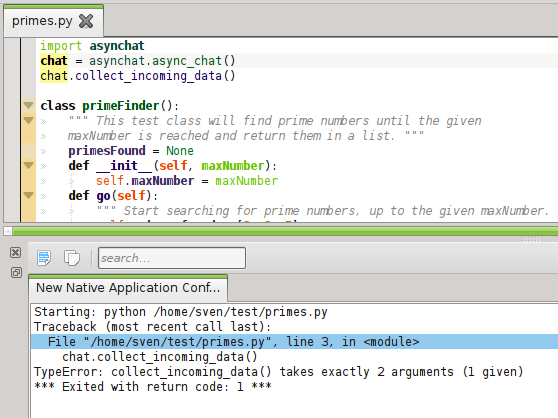 Semantic syntax highlighting, as seen in the above screenshot. 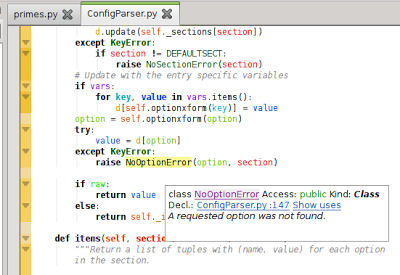 You can configure what script to launch with which python version in the Run » Confiure Launches dialog. Be sure to select “Script Application” in the list on the left side! First of all, this should not be considered an official release meant for production use or packagers. It’s merely a preview. The plugin is currently not very stable yet, but in my opinion it’s usable already. I recommend installing the plugin into a local directory (like ~/install) so you can safely and easily get rid of it in case you encounter major problems (the build system is not very reliable yet, sorry for that). It is very important that you use git to checkout the current master branch of both kdevelop and kdevplatform. If you download the tarballs, the plugin is NOT going to work, as it needs some recent changes in kdevplatform. You also cannot use it with any packages provided by your distribution currently. There will hopefully be packages in the future, but not until the plugins and all its dependencies have seen a stable release, which will at least take a few months. You can now checkout the alpha1.1 release by typing: “git checkout alpha1.1”. However, I do not recommend doing so, as I’ll continue doing bugfixes in the master branch and you probably want to have them. You should of course specify a correct install path (-DCMAKE_INSTALL_PREFIX=/…) like for KDevelop and KDevPlatform. Especially you must not forget about the “make parser” step; it will compile a modified and stripped-down version of python (don’t worry, it will not (should not? 🙂 touch your system’s python installation) which is needed by the plugin code. Then just run “kbuildsycoca4” and start up kdevelop. You should now have fancy syntax highlighting and stuff in any .py file. Have fun! If you encounter any problems while installing or if the plugin crashes, please tell me! I’m very interested in fixing those problems as soon as possible. We demand Django support ASAP!!!! Basic support should be there with the latest commit (although it's nothing django-specific, the plugin will find its way through some of the django sources). I love you man ;D. Now just waiting for C# support in KDevelop and I'm content. Thank you for making Python support possible. 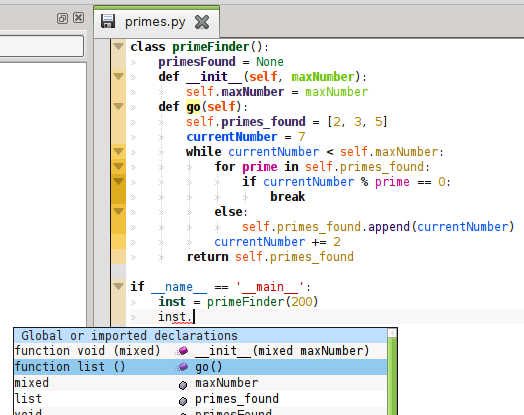 Will make Python develop more easier and fun to work in now. I tested it and runs! make: *** Pas de règle pour fabriquer la cible « KDevPlatformImport__kdevplatformlanguage-NOTFOUND », nécessaire pour « lib/libkdev4pythonparser.so ». Arrêt. Could you help me ? Thanks. it seems that it doesn't find kdevplatform. Did you install kdevplatform from git, maybe best into the same directory (-DCMAKE_INSTALL_DIR) like the plugin? Always look out for error messages, i.e. cmake should notice and tell you when libraries are missing. As this is probably not of huge public concern, could you please email me for further discussion? Thanks. Attaching the whole output of the cmake command might be helpful. Also, please use the "alpha2" tag, current master is broken (sorry). Ooops… my bad. Seems I missed the "parser" target and instead ran make with no target. great work mate , great work ! I compiled and installed the code without any errors but I cannot see it in the plugins page in the settings and the autocomplete feature (or anything that would indicate the plugin is running) does not work. Am I missing something very trivial? Make sure you're running the vey latest version of kdevelop and kdevplatform (from git). Also verify that KDEDIRS is set correctly and that you ran kbuildsycoca after setting it. I'm sorry, what KDevelop release I need to use this plugin? For now I'm using 4.2.3 version, but I'm not sure it is the very latest one. for the newest version of the plugin, you need kdevplatform 1.3 beta, which is tagged "v1.2.80" or similar. This is only available in git. 1.2.3 (or 4.2.3 for kdevelop) is the latest stable version, but is quite old and will be replaced by a new release in a few days. and there i do not now what to do? You're trying to build against kdevplatform 1.2. This does not work. You need kdevplatform 1.3, which you can either build yourself from git or wait for the release which should happen in a few days. Do you have kdevplatform 1.3 (not 1.2, and not 1.4)? Do you have the plugin installation directory in your KDEDIRS? Did you run kbuildsycoca –noincremental after fulfilling the other two requirements? I'm sure to have kdevplatfrom 1.2.3 but how do i check for KDEDIR? You don't need kdevplatform 1.2.3. It's too old. You need kdevplatform 1.3. one point three. *or* adjust the x-kdevelop-version in the python .desktop file (increase it by one) to make it work with 1.4 (i.e. 1.3.60). The KDE policy of having a.b. (large number) be the beta version of a.b+1 is a bit confusing, that's true. I have installed kdevelop 4.3.1 and kdevplatform 1.3.1. Built the python plugin. There were no errors. BUt I am not able to see the plugin. My KDEDIRS is pointing to the installation path of kdevelop. the current master branch of the plugin needs the current kdevelop / kdevplatform 4.4 beta in order to work. Sorry about that. 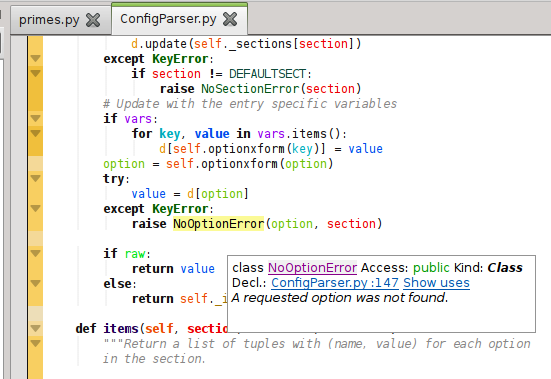 Would you kindly advise then which version of the python plugin I must use to suit my kdevplatform/kdev combination ? there's a branch called "1.3" in kdev-python which you can use with kdevelop / kdevplatform 4.3. However, some grave bugs have been fixed since and there's a lot of new features which are not available in that branch. For trying the plugin out it should be sufficient, tough. The release of kdevelop 4.4 is not too far away, so you'll probably be able to use the master branch of the python plugin with your distribution's packages for kdevelop/kdevplatform soon. Do you have to register or install the compiled plugin? I just used git and compiled kdevelop, kdevplatform, kdev-python and I don't believe the plugin is showing up in kdevelop. All went well with the compile, It is kdevelop 4.6, it runs fine, just no Python. I have another packaged version installed on a different computer and when I open a python file it has many colors. This one looks like regular text highlighting. Make sure you have the current master of kdev-python compiled (1.5 or 1.4 won't load in kdevelop 4.6). Then try running kdevelop from the same terminal session.